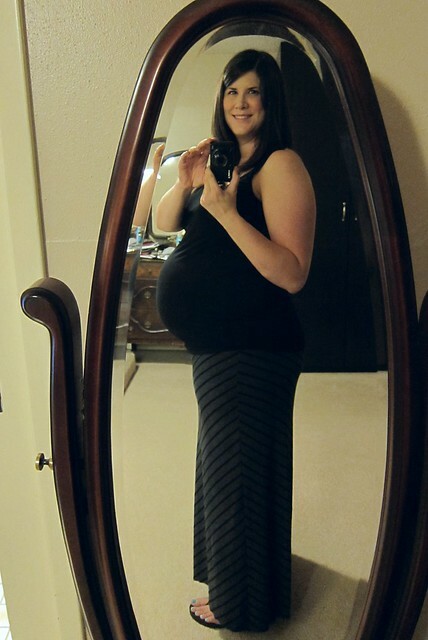 The bump: Low and roundish. It's nice being able to breathe, but this baby needs to GET OUT! 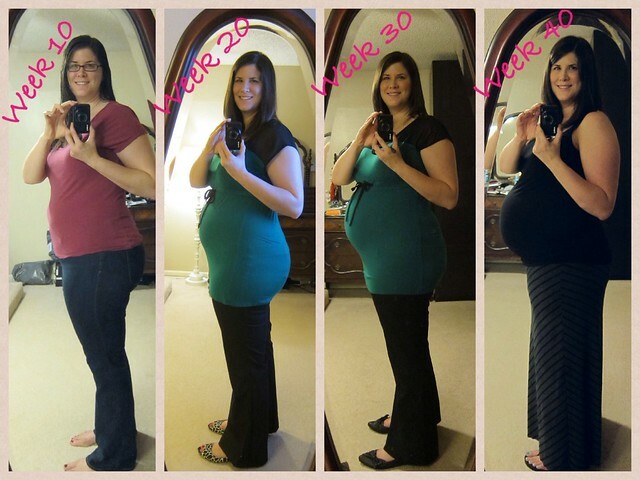 How far along: 40 Weeks! Helllllllooooooo due date! How big is baby: From The Bump: Your baby's the size of a jackfruit! In month nine, the average fetus is about 6.2 to 9.2 pounds and measures about 18.9 to 20.19 inches. But you really won't know exactly how big your baby is until his birth. He's continuing to grow hair and nails. And he's keeping up that lung development, too. My midwives are guessing he's in the 8 lb range. I'm guessing 8.4 and 21 inches, but we'll see! Weight gain/loss: I'm down 1.6 pounds this week for a total of 28.6 pounds gained. I'm almost positive it is all water weight since I can actually see my ankles for the first time in weeks. Stretch marks/belly button - nothing new to report here. Still have both. Sleep: I've been sleeping really well. My knees and legs do tend to be a little sore when I wake up from being curled around my giant pillow, but pretty much my entire body hurts when I get up now. Diet/Cravings/Aversions: I've been downing eggplant, pineapple, spicy food, and raspberry tea like it's going out of style. Nothing is helping though. Movement: Some squirminess, but nothing major. He's definitely slowed down quite a bit. What I'm loving: Not much at this point. I'm pretty cranky. Symptoms: Lots of Braxton Hicks and lots of irritability. I'm also way overemotional. All expected at this point. I also feel like I took a cycle class - can't imagine what it'll feel like after pushing a kid out at this point! What I'm looking forward to: Being done and having this kid here already. Best moment of the week: I honestly didn't have one. Last week was pretty crappy. I went to my appointment hoping for them to at least check me or strip my membranes or do ANYTHING and got a big fat "enjoy this time" and two appointments scheduled - one for Friday and one for next Monday. Combined with family members tagging me on their "Push" crap among other comments from other people I was just done. I broke down in my car in my office parking lot and had a good 30 minute cry. John eventually calmed me down and I went in and decided to start my maternity leave on Monday. I cried several more times as I wrapped up my day and spent the entire weekend in bed hiding out. It was seriously what I needed though. I woke up yesterday feeling a million times better even though I'm so ready to just be done with pregnancy. My boss was fantastic about me just up and calling it quits too. Yesterday John's boss told him to also go ahead and take off so we're both just sitting here waiting. John has been great at fielding calls and basically telling people to leave me alone at this point. It'd be nice if family could take the hint that it's THEM we're talking about! I know people are excited, but I'm so over it at this point, and am so thankful that John has taken over. How I'm feeling: See above. I'm hoping today will be the day even though it's really only a 5% chance that I'd deliver on my due date. I honestly never thought I'd be writing this post. It is a full moon tonight and my favorite midwife is the one on call so it'd be a good day to have a baby. You know, if he decided to actually cooperate. 40 weeks!! You're in the home stretch, even though it seems it will never end. Baby will be here SOON! Big hugs! He'll be here soon after his dramatic entrance. Olive waited until sunrise following a full moon and craziness in L&D. C'mon baby! c'mon frijole! the last month of pregnancy is soo hard and uncomfortable, but it has to end soon! you may not see it now, but you'll miss being pregnant one day, or at least some aspects of it! Yay - you made it to your due date! I had my first on her due date so it does happen :) I'm sure you're so so so ready to meet your little one and everyone says it and you totally roll your eyes in the moment...but seriously, enjoy these last few hours, days. Try to get some sleep (impossible, I know). And good luck with L&D! Hoping it's not days, but what can I do? I've been hearing all day from people that had theirs on their due dates. Fingers crossed! Yikes! Good luck and hopefully he comes sooner than later. I was the opposite, I kept wanting to wait even though I know my body couldn't have taken much more. Keeping my fingers crossed for you! Wow - Frijole has DROPPED! Come on out of there, little Sir! Sending you lots of baby eviction thoughts; Happy 40 weeks! He's sooooo low. Guessing that's where the spin cycle class feeling is coming from. It's like there's a bowling ball down there. You've gone from any day now to any minute now. How exciting!